A RANGE OF QUALITY LOFT LADDERS TO SUIT OCCASIONAL OR REGULAR USE. ALUMINIUM OR TIMBER AT COMPETITIVE PRICES. 2 SECTION QUALITY DOMESTIC LOFT LADDER. FITS OPENINGS AS SMALL AS 457mm x 406mm. CERTIFIED AND TESTED TO BS 7553 G GERNERAL USE. FLOOR TO CEILING HEIGHT MIN 1.43m MAX 2.6m. ARC CLEARANCE IN LOFT 1.213m. 3 SECTION ALUMINIUM LOFT LADDER WITH HANDRAIL. QUALITY LOFT LADDER FOR OCCASIONAL USE. CERTIFIED AND TESTED TO BS7553 CLASS G GENERAL USE. SUITABLE FOR OPENINGS FROM 508 mm x 432mm. PIVOT ARM FOR SMOOTH OPERATION. UNIQUE SHOOT BOLT FOR SAFETY AND EASE OF USE. FLOOR TO CEILING HEIGHT FROM 2.3m TO 3.0m. HORIZONTAL CLEARANCE IN LOFT 1.050m. SUPERIOR 2 SECTION SLIDING LOFT LADDER. TWO HANDRAILS FOR TOTAL SAFETY. FITS OPENINGS FROM 686mm x 508mm. CERTIFIED AND TESTED TO EN 14975. SPRING ASSISTED PIVOT ARM FOR SMOOTH OPERATION. MIN FLOOR TO CEILING HEIGHT 2.31m. MAX 3.25m. 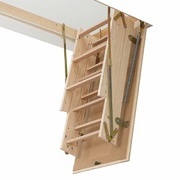 LADDER ATTACHES TO LOFT HATCH TO ENABLE EASIER ACCESS. VERTICAL CLEARANCE IN LOFT 1.030m. HORIZONTAL CLEARANCE IN LOFT 1.600m. DUTY RATING 150/23.5 WEIGHT 18.4kgs. 3 SECTION FOLDING TIMBER LOFT LADDER. TESTED AND CERTIFIED TO EN 14975:2006. NO ARC,STORAGE OR CLEARANCE SPACE REQUIRED IN LOFT. SOLID SPRUCE,FSC & PEFC CERTIFIED. WHITE FACE TO TRAP DOOR. RUBBER DRAUGHT EXCLUDER ON CASING AND TRAP. HANDRAIL TO ENSURE SAFE CLIMB. EASY OPERATION, TIMBER PUSH PULL ROD INCLUDED. LADDER SECTION NOT FITTED TO TRAPDOOR, REQUIRES INSTALLER ASSEMBLY.